Before you buy a bull, consider what you need to improve. For many, this is the time of year when bull purchasing decisions occur. Before you buy a bull, consider what you need to improve. • What are my breeding/marketing goals? • What traits directly impact the profitability of my enterprise? • Are there environmental constraints that dictate the level of performance that is acceptable for a given trait in my enterprise? Once these three questions are answered, sire selection becomes much simpler. The answers to these questions inherently lead a producer to the traits that are economically relevant to their enterprise. We call these traits Economically Relevant Traits. Fundamentally these are traits that are directly associated with a revenue stream or a cost. All traits that are not ERTs are indicator traits, or a trait that is genetically correlated to an ERT but not an ERT itself. A classic example of an indicator trait is birth weight. Selection to decrease birth weight in an attempt to reduce the prevalence of dystocia is practiced by numerous commercial bull buyers. However, birth weight does not have a direct revenue source or cost associated with it. The trait that does have a cost associated with it is calving ease (or difficulty). Calving ease is related to the level of assistance needed during a calving event. Although the two are related, the genetic correlation between calving ease and birth weight is only between -0.6 and -0.8, suggesting that birth weight only explains 36-64 percent of the genetic differences between animals for calving difficulty. Consequently, to reduce calving difficulty, bulls should be selected based on calving ease EPD and birth weight EPD should be ignored. Selecting to improve multiple traits simultaneously can be cumbersome, but is necessary given multiple traits act together to inform the profitability of cow-calf enterprises. Just open up any sale catalog and it is easy to become confused immediately. Economic indices can help alleviate this confusion. An economic index is a collection of EPDs weighted by their economic value such that traits with greater impacts on production goals have a larger economic weight associated with them. These tools allow producers to select bulls based on their genetic potential to improve net profit. When making selection decisions based on economic indices, it's important to consider your particular breeding objective and the traits that will achieve desired production goals. For instance, if your production goals included retaining replacements and selling cull heifers and steer progeny at weaning, then an index that assumes all offspring are sold on a grid-based system is inappropriate for your operation. It is also important to know the breed average values for particular indexes and to use percentile ranks to determine how far above or below average a particular animal is compared to the rest of a breed. A current research project at University of Nebraska-Lincoln with collaborators from Kansas State University, the U.S. Meat Animal Research Center, and Theta Solutions, LLC, is working to develop a web-based tool for producers to develop their own customizable index based on their herd level economics and production levels. 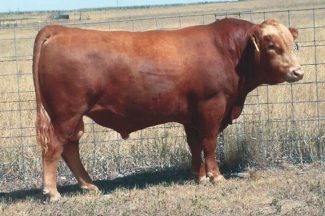 This tool would enable indices to be developed by bull buyers and applied, across breeds, to bulls on offer that a commercial bull buyer is interested in. As part of this effort we have been seeking input relative to current uses of genetic selection technology, selection indices, and use of technology overall. The responses we received during that effort will help us as we develop a web-based selection support tool.